Joyce Andersen is a veteran musician who has enjoyed a varied 20 year career as side-gal, session player, singer-songwriter, and band leader. Her live shows and recordings showcase her versatility as a vocalist and violinist who thrives on writing and interpreting songs across many genres from old-time, rock & Americana, spirituals, folk, pop, & swing. 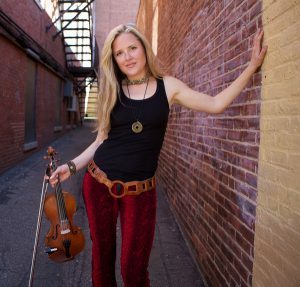 She started getting critical acclaim and radio play in the folk world with her first full length CD “The Girl I Left Behind” (2000) for it’s songwriting, breadth of styles and her unique ability to harmonize her vocals with her violin. Her latest CD “SWERVE!” (Oct. 2011), marks the invention of her innovative new “violin troubadour” sound which reflects her strengths as an improviser, and her new found interest in using technology (loops, effects etc.) to harness new sonic landscapes and launch into extended psychedelic jams. In 2017 Andersen started her genre-busting band “Joyce Andersen and the Band of the Willing” with husband Harvey Reid (guitars), Kent Allyn (keys), Rob Kneeland (drums) and Steve Roy (bass). As yet un-recorded save a few live videos, their uplifting and wide reaching repertoire, draw from original favorites, brand new inter-faith spirituals, and ambitious covers from the folks like Nina Simone, Rosetta Tharpe and Bob Dylan. Andersen has made 9 CDs: 5 solo and 4 with husband and folk virtuoso, Harvey Reid. She lived and toured out of Boston, Nashville, and NYC before returning to her native New England in 2000 where she lives with her husband and their two boys, in York, ME. Andersen’s music has brought her from the coffeehouses and taverns of her native New England, national & international touring as a solo artist and with husband, Harvey Reid, Childsplay, Eric Andersen, Richard Thompson and a host of other artists in her side-gal days. She even made it to Carnegie Hall and the Conan O’Brien show. She just started a new chapter in Oct, 2017, as musical director of an alternative chruch service on Thursdays at First Parish Church in York, Maine.